Derrick Kosinski & Scott Yager are joined by Weston Bergmann. Wes (@WestonBergmann) has won more eliminations than any other Challenge competitor. Wes has 2 Challenge Championships. Wes has appeared on all 3 Champs Vs Stars spin-offs. So why hasn't Wes been on Challenge Mania yet? Even though Wes has admitted to BEING a Challenge Maniac himself, having listened to most of, if not all of the past episodes, it took 62 episodes to get Wes on the show because simply put...if you ask ... Más informaciones anybody...Wes and Derrick do not like each other. At least, that's what they thought. That's what we thought. That's what the internet thought. Over the past few years, it has felt that you have had to either identify as "Team Wes" or "Team Derrick" and tons of Challenge fans who root for and respect both of them have been torn by the well-publicized differences between the two legends of the game. Today, that all comes to a head. Wes joins Derrick (@DerrickMTV) and Scott (@SHOTOFYAGER) to set the record straight on what exactly caused them to develop this real-life rivalry over the years, and over the course of a 90+ minute conversation, the guys navigate through each and every moment that drove them apart. This episode is a MUST LISTEN for any Challenge fan, particularly those who have always wanted to get to the bottom of one of the most talked about rivalries in the game. The goal is to "PUT A BOW" on the bad blood and put the past in the past, no matter how long it takes. Listen to find out if that bow ever gets properly applied! If it does, maybe Wes will stick around for a Part II to talk about everything ELSE in the Challenge world BUT him and Derrick. Let's cross our fingers! 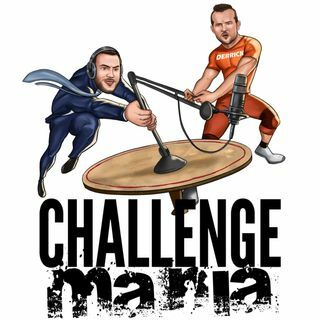 Remember if you want even MORE Challenge Mania, we drop at least one bonus podcast on www.Patreon.com/ChallengeMania every week, where we break down each episode of The Final Reckoning and take YOUR QUESTIONS! *We encourage you to check out PANTEPIC! Just head to www.Pantepic.com/podcast to download their amazing app today! It’s available on IOS and Android in over 100 languages.